LIFESTYLE property developer Eastern and Oriental Bhd (E&O) has obtained approval to proceed with reclamation works for phase 2 of its Seri Tanjung Pinang (STP2) development here. In an announcement to Bursa Malaysia yesterday, the company said a letter dated November 25 was received on December 5 from the State Town and Country Planning Department. 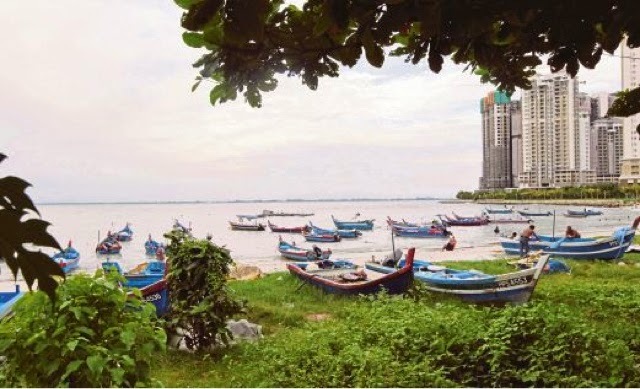 “In their capacity as Local Planning Authority, the department has granted planning permission for land reclamation works in accordance with the approved master plan in relation to STP2 to Tanjung Pinang Development Sdn Bhd (TPD),” E & O said. Its subsidiary TPD had in 1992 won the right to reclaim and develop 396ha in Tanjong Tokong, and has reclaimed some 97ha in Phase 1 (known as STP1), which has seen the emergence of a millionaires’ enclave of residential homes, a commercial block and marina. The project’s history can be traced back to 1984 when it started off as a joint venture between Permaijana Ribu (M) Sdn Bhd (owned by UEM Bhd, Penang Bumiputera Foundation and Magma Bhd) and Koperasi Gabungan Negeri Pulau Pinang and Penang Development Corporation. The Penang government, via the PDC, holds a 21.2 per cent in TPD. The approval, noted E&O is conditional upon, among others, TPD in due course, surrendering 77.3ha of reclaimed land to the state government, which is reportedly for infrastructure development of a new expressway, a new Gurney Drive promenade and a public park. With the approval for the commencement of reclamation works for STP2, TPD is inviting qualified and experienced contractors to take part in a pre-qualification exercise for the reclamation project. It is open to all Malaysian and/or international contractors as well as joint ventures, who meet all mandatory requirements as stated in the Notice of Pre-Qualification published in the national dailies. The company said the main scope of works include land reclamation, soil improvement, dredging, coastal protection, marine piling and other associated marine works. The closing date for the submission of the completed pre-qualification document is December 24 at 12 noon. “At STP1, we have fully complied with our contractual obligations by surrendering a total of 10.9 ha as state government reserve and land for public uses, as well as 8ha for the Penang Outer Ring Road alignment. “At STP2, over and above the contractual obligation to surrender 24.2ha on the reclaimed island, E&O has agreed to reclaim at its own cost and surrender a further 53ha along Gurney Drive, bringing the total of 77.2ha to be surrendered to the state government as E&O’s contribution to infrastructure development,” E&O said in a statement.